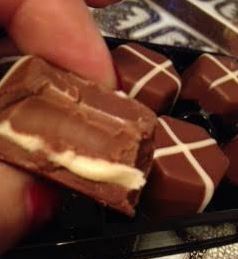 I was lucky enough to be invited to the Easter launch of Hotel Chocolat and some of the delicious bits they were launching made their way into my goodie bag (including some chocolate covered popcorn with popping candy). Included in this amazing bag of awesomeness were some of the smaller items. 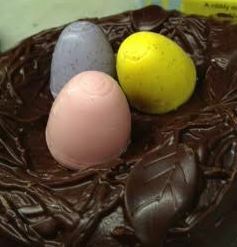 A Nest of Egglets – This 50% milk chocolate heavy nest with 3 coloured eggs that are so cute. The eggs seem to be white chocolate with natural colourings which give them a wonderful pastel hue for Easter. 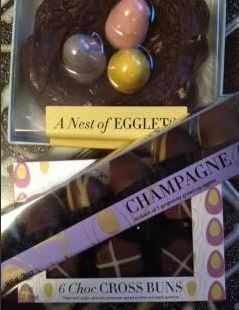 The three eggs may seem like not much in the nest until you realise there is 190g to this chocolate next and egglets. The egglets are deliciously flavoured with a bit of bite while the 50% milk chocolate nest reminds me of the little wreaths you get at Christmas. It has puffed rice and caramel bits in it like toffee bits. It is a solid chunk of chocolate and a pretty good deal. 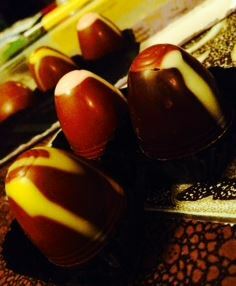 Champagne Egglets – These are lovely boozy ganache-filled eggs. My goodness I hid these from my acquisitive husband. For a diabetic he claims a LOT of mu chocolate. So these are boozy and really, what else do you need to know? Well, they’re tasty too… uuuhhh and deeply boozy! I love these little gifts and as they are more affordable than the bigguns so if you’d like a little treat they are less expensive and still yummy.